FT AC-56. Winter in the City. 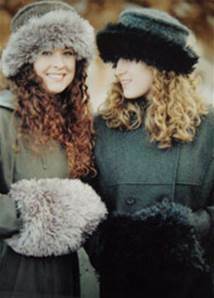 Stylish and practical felted hat and muff, combining eyelash yarn with pure wool worsted (approx aran weight). Felt to most adult sizes. Pre-felting tension 15st to 10cm on 6.5mm needles. Quantity given in yards, US style. Hat 345 yards pure wool worsted (approx aran), 90yds eyelash yarn. Circular needles 60cm x 6.5mm and 8mm. 6.5mm dpns plus spare circular needle 5mm or smaller.